Oh, this sounds like a must-read! Onto the wishlist it goes!! PS Are you at GoodReads? Though set in a very different time as my own, when I was in my 20s I always had this fear of a lonely drab future that could come in my 30s. Luckily it did not happen but this book seems to tell a tale that reflected my concerns. Based on your commentary the characters sound very well drawn so this sounds like a book that I would like. Thank you, Brian. Yes, it must have been a very difficult time for a young woman in Miss Roach’s position, and whilst some of the scenes are darkly comic, Hamilton really captures the drab and oppressive nature of this woman’s existence. I’m relieved to hear that your own fears of a drab future did not come to pass. Yes, great characterisation and mood here – I think you’d enjoy this one. This sounds great; another book to add to the list! I really loved this one, Gemma; one of my favourite reads this year. A wonderful book – thank you for reminding me just how good Hamilton was. Oh, thank you, Fleur – that’s so nice to hear. I have a couple of Hamiton’s other novels on my shelves, and I’m looking forward to reading more by this author. Have you read any of his others? Yes, it’s very atmospheric, and Hamilton seems to have captured this period so well (as far as I can tell, anyhow). I love Hamilton’s writing and I keep hearing good things about this one – so I’m really looking forward to it! Yes, they’re often bracketed together, and if you like Hamilton I’m sure you’ll llike Maclaren-Ross. Cheers – Of Love and Hunger sounds just my type of thing. I’ve got two of his books but always postpone reading them. I really shouldn’t. It does sound wonderful. I loved this one, Caroline; Hamilton’s definitely worth a try. I’d be interested to hear how you find him. I’ve read Hangover Square by him and it stayed with me. He writes wonderfully and he has a way to take you in his characters’ heads. Thanks, Emma. I’m very glad to hear you enjoyed Hangover Square. I have a copy of it on my tbr pile, and I’ll probably save it for next year just to put a bit of space between the two. I loved Hamilton’s writing, the characterisation, the mood – everything really. I can’t recommend this one highly enough if you want to try another by him at some point. I only know of Patrick Hamilton from seeing his books next to James Hamilton-Patterson’s on the bookstore shelves, and this may well be the first review I’ve read of anything by him. I’ll put it on the TBR list. I really loved this, Scott; I can’t recommend it highly enough. You have reminded me that I really must read more PH . I read Hangover Sq years ago ….and also watched adap of Twenty Thousand Streets on BBC4. He does seedy so well doesn’t he ? Oh, he does! Slaves is great, Helen, and I’m sure you would enjoy it. I think Hangover Square will be the next Hamilton I read, and I have a copy of Twenty Thousand Streets, too. Somehow I just knew I’d love this author’s work. Having bumped into many positive mentions of Hamilton, particularly Hangover Square, over the years I recently found one of his books (The West Pier) and must read it soon. I’d be interested to hear how you find The West Pier, Seamus. It’s part of his Gorse Trilogy, isn’t it? 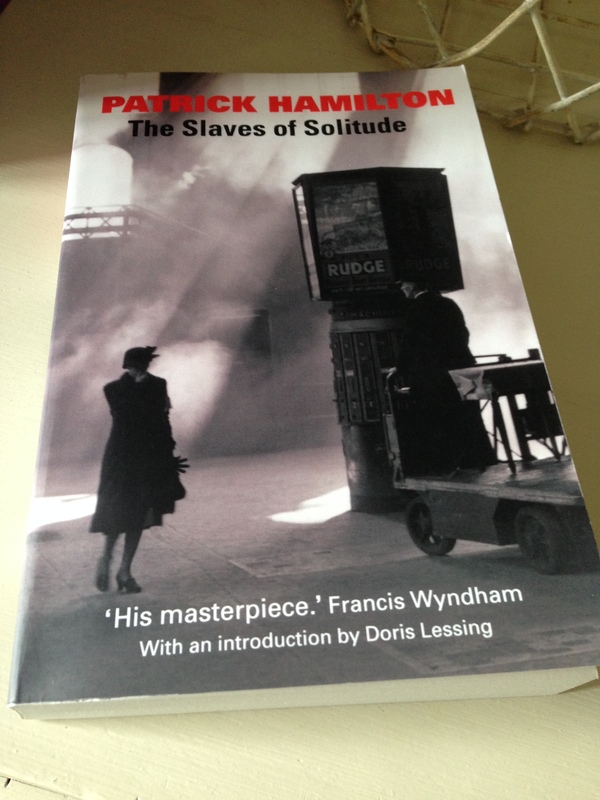 Funnily enough, I’ve encountered much love for Patrick Hamilton this week, especially for Slaves and Hangover Square. Yes, so it is – I’ll have more books to find if I like it. It’s the first part anyway.. Thanks for the pingback. I loved this, as you did. Nobody captures that feeling of being trapped and of petty bullies like Hamilton. I think most people have been in a situation where someone belittles you, but in a way that’s impossible to pin down, where any quote could seem innocuous. Hamilton captures that petty viciousness so well. Also as you say it’s that sense here of what austerity means, the drabness, the absence of little luxuries and tedious public messages. Have you read Julian Maclaren-Ross’s Of Love and Hunger? If you liked this you may well like that. If the name hadn’t been taken it’s the book I was going to originally name my blog after. Very welcome, Max. I’m sorry I hadn’t picked it up before yesterday. I should have checked yours earlier as I wasn’t surprised to discover that you’re a Hamilton fan. I know exactly what you mean by that tactic of small-minded bullying. Occasionally I’ve seen it happen at work, where the remarks are impossible to criticise when taken at face value; usually it’s a person’s tone and demeanour that make the experience so belittling and slippery. Hamilton really gets this, along with the penny-pinching atmosphere of wartime. I’m reading Of Love and Hunger right now, and it’s absolutely bloody marvellous! It’s this year’s Slaves of Solitude for me. Thank you for another brilliant recommendation. Hurrah! Glad you like it. Lermontov, yes. Guy has some excellent posts on Lermontov at his. Great, I’ll take a look at Guy’s. And I must read your Ross Macdonald reviews too, hopefully over the weekend. I see from the time stamp on your post that it’s more than a year since I read this review and decided I had to read The Slaves of Solitude! I have just finished reading it and found it as brilliant as you made it sound. What an excellent novel. I’ve never read anyone better on the petty, unsaid aspects of human relationships. I adore your description of it as ‘a black tragicomedy of manners’ – that’s perfect. I also watched Gaslight based on his play (the 1940 British one) and loved that. Will definitely be picking up more of his work. And I have Of Love & Hunger to get to as we discussed! Hurrah! I am so thrilled that you loved this novel. It’s one of those books that I want to press into the hands of friends and strangers alike. I completely agree with you on Hamilton’s skills in portraying those petty exchanges between individuals. God, what a dismal existence that must have been for Miss Roach, especially with Mr Thwaites chuntering away in the dining room. I really enjoyed Gaslight, too. It got a limited (re)release in cinemas a couple of years ago, and I managed to catch a screening at the BFI – just perfect. And did you know that Hamilton wrote Rope, the play that became a Hitchcock film? He certainly knew how to write a good drama that’s for sure. I have another Hamilton (Hangover Square) just waiting to be read, so I hope to get to it next year…and his trilogy, Twenty Thousand Streets Under the Sky is on the shelf too. I can’t wait for you to read Of Love and Hunger – I’m pretty sure you’re going to love that one as well! I didn’t know about Rope until I saw it listed in the paperback under other works! I happened to have watched it a few years ago – my boyfriend has a Hitchcock box set that we pick from every so often. Looking forward to Of Love – I’m going to do the same as you mention in an earlier comment and leave a wee while between it and the Hamilton. Great. I love those old Hitchcock films – I never seem to tire of them despite repeated viewings. My cousin has just alerted me to your site as she’s spotted reviews of many of my favourite writers such as Elizabeth Taylor, Barbara Pym, Patricia Highsmith and, of course, Patrick Hamilton. I finished reading The Slaves of Solitude a few weeks ago, having read Hangover Square and Twenty Thousand Streets Under The Sky. His writing is utterly compelling. It was days before I could read anything else after I’d read Hangover Square – I felt emotionally drained by it. The Slaves of Solitude has many of his familiar characters and themes: the alcohol dependent, here Lieutenant Pike, the bombastic pedant (Mr Eccles in Twenty Thousand Streets) Mr Thwaites at The Marigold and, curiously, the redemptive theatrical. Just as George Bone’s misery over Netta is fleetingly vanquished by the kindess of impressario Eddie Carstairs and Johnnie in Hangover Square, so Mr Prest the long resting thesp saves Enid Roache from her feelings over The Lieutenant by revealing his promiscuity. The moment I started reading it, following Miss Roache home in the blackout through the “three-times-night . . . like moonlight gone bad” I was hooked. I’ve yet to read his biography (it’s on the shelf ready) but his alcoholic, broken life created, I suspect, a need, or at least an ability, to observe humanity and render it on to the page with a detached poignancy and fatalism embellished by his unique power of description. Beyond The Gorse Trilogy I want to read everything he ever wrote. Thank you for such a thoughtful comment about Patrick Hamilton’s work, one that makes me want to experience The Salves of Solitude all over again! I don’t know if you’ve read it, but if not, his second novel, Craven House, is also worth a look. While it isn’t as polished or focused as Slaves or Hangover Square, there’s still a lot to enjoy, particularly in the characterisation and themes. In some ways, he’s almost laying the foundations for The Slaves of Solitude, mapping out his territory for future development. It’s also less cynical than his later works – he was just twenty-two at the time, so it’s free of much of the fatalism that characterises those later novels. Thank you and also for the recommendation. I’ll look up a copy of Craven House. He was only back in print about two years ago after a long absence which is when I started reading him. It will be intersting to read him at an earlier stage in his career. I think that’s what I enjoyed about Craven House, the chance to see the genesis of some of his familiar tropes and themes. It’s definitely a fledgling work, but still very interesting nonetheless. I still need to read one of his big hitters, Twenty-Thousand Streets Under the Sky, which I’ve been trying to save for a rainy day. Maybe later this year, once I’ve finished the Anthony Powell. Oh do read Twenty Thousand Streets! I felt stunned when I finished reading it, just like Hangover Square. It’s what Hamilton does – he takes the lives of little, insignificant people and makes you care about them. If he had written them today you would almost accuse him of having done too much period research and forcing it into the narrative but these are contemporary novels. Knowing what was on at the cinema, and what it was like to have tea in an ABC milk bar and just, through his descriptive powers, to be able to stand in a foggy London street late at night in the Thirties or lie awake in a seedy bedroom with a hangover, anxious over something makes for the most amazing read. You live his novels. I shall look forward to whenever you start reading it, to see what you think and compare thoughts.